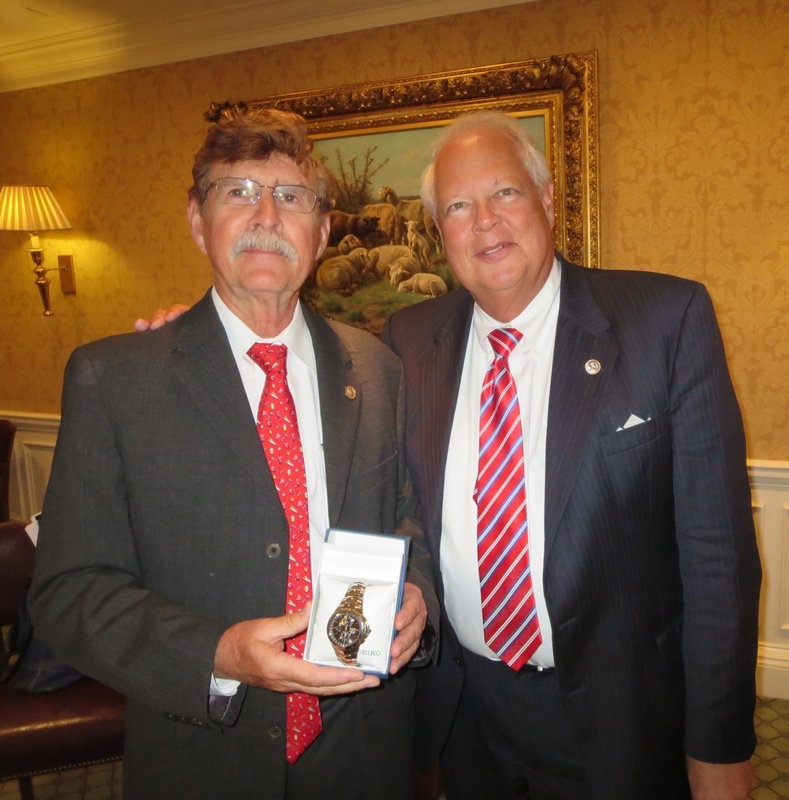 Douglas R. Chambers, left, the Hero Fund’s director of external affairs, made his last medal presentation in late June 2016 and retired from the organization a week later. He is shown with Commission treasurer Dan D. Sandman at the Commission’s 112th annual board meeting, held June 23, 2016, where he was given a Seiko watch, all bells and whistles included. Chambers joined the Hero Fund in 2002 as managing director and immediately assumed oversight of preparations for the Commission’s centennial observance in 2004. It was no small task, as it included editing a book on the history of the Hero Fund and producing its accompanying video; arranging a dinner and ceremony, which featured noted historian David G. McCullough as speaker; putting together a display of medals from all of Carnegie’s hero funds for debuting at an American Numismatic Association Convention; and coordinating the production and distribution of a limited-edition medallion, made in the likeness of the Carnegie Medal, to circulate as a cultural artifact. After the party, Chambers centered on outreach activities, including coordinating personal presentations of the medal both by himself and by a volunteer cadre of past awardees. His engagements took him from California to Nova Scotia, where on June 21 he gave the medal to March awardees Stephen Ross and Keiren J. Tompkins, both of Halifax, who teamed up to rescue a man who broke through ice and fell into rushing water about four feet below. The book that Chambers edited, A Century of Heroes, received an award of excellence in 2005 from Communication Arts, and it, with its accompanying video, remain a part of the medal presentation given to each awardee. The book is available for the $3 cost of postage through the Hero Fund; contact Jo Braun at jo@carnegiehero.org. See PDF of this issue.